Where is Bob? : Guest Blog from twitter handle @danmoyle - Go Kalamazoo! Guest Blog from twitter handle @danmoyle - Go Kalamazoo! When Jeremy asked me if I'd be interested in guest blogging for Biggby Bob, it was right after a Spot Bob event. (the one on Gull Road - what a great cafe!) I got the chance to meet the man - Bob himself! Well, he goes by Bob. "Himself" is something I just added. Anyway -- I was thrilled. I love the Biggby attitude. No matter what kind of day I'm having, stopping by a Biggby or reading the ongoing Twitter conversations or Bob's blog always makes me smile. And it's more than the tasty java - you can't get that from Twitter. I've tried. It tasted funny. So I know it's the contagious Biggby attitude. Watching Bob meet and greet and chat with people at the Spot Bob event was evident of how much this Michigan company loves its fans. Not just customers -- fans. I felt like I was a member of his team, just sitting at the table and chatting, meeting fellow Biggby fans... it was great. So I look forward to spreading the love with Bob's blog. It's a great chance to B Inspired! Dan - you are always great on Twitter and talking about trying to taste coffee on Twitter and it tasting funny made me laugh! You are a true BIGGBY COFFEE loyalist, so for that we thank you!!! 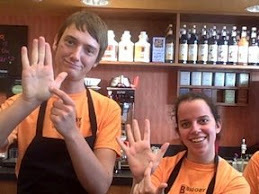 Keep up the BIGGBY COFFEE way - B happy, have fun, make friends, love people, drink GREAT coffee!! Dan, your energy and positive attitude is contagious. So glad you got to share it with the Biggby Universe! XOXOXOXOX Dan - you know who this is! Nice work! Okay, I confess, it's Jeremy. XOXOXOX. Kidding! But I am so glad that you've signed on and are getting engaged with blogging for us! As fun as you are on Twitter, it's great to see you expressing yourself in greater-than-140-character doses! Jeremy has a serious case of man love going on. I'm getting worried for him. As for Dan I'm glad he is a Biggby fan. Is that anything like being a Cubs fan? Not that I consider Biggby a bunch of loveable losers, hardly. But Biggby isn't a sports team, or a political candidate. It's a coffee cafe with really good coffee and nice people. And Bob, well, I hope I never see the day when his "fans" talk him into running for office. OMG! A nightmare! Thanks for the love everybody! Thanks for keeping us all laughing and inspired Dan! Always enjoy hearing from our fans and you are just that! 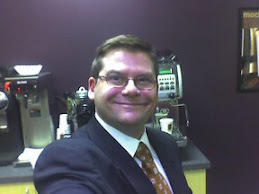 Dan so glad to hear you are a fan of BIGGBY COFFEE! I agree BIGGBY customers are more than customers they are fans and we are fans of each one of you! I love hearing from you all the BIGGBY fans on twitter - what a great way to stay in touch!